A family home of over 2000 sq.ft. 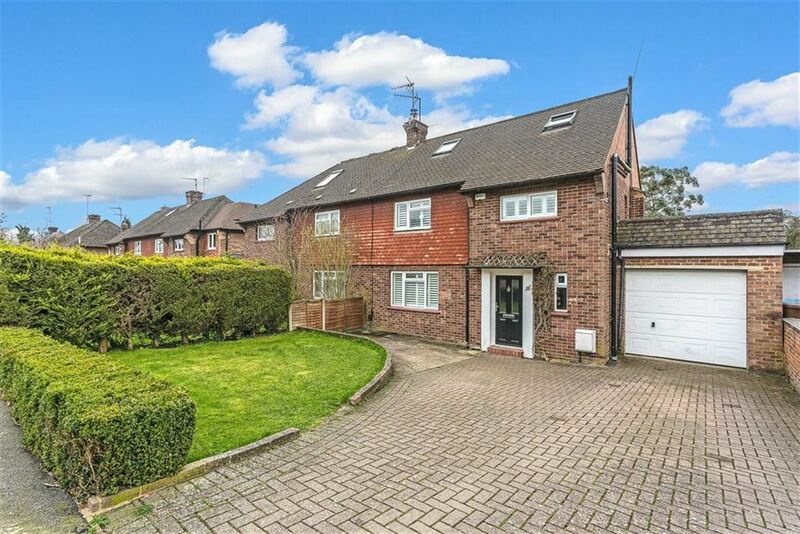 in a central Oxted location. Set over three floors, stylishly presented and benefiting from a 40m (approx) westerly facing garden. The property offers off road parking, extended ground floor accommodation and master bedroom with en-suite shower room. EER 66. From our office proceed down Station Road West to the roundabout at Church Lane and take the right hand turning. Continue along Church Lane into Barrow Green Road and then take the right hand turning into Gordons Way and the second turning on the right into Central Way. Number 16 is a short distance on your left hand side. Front door leading to entrance hall, front aspect frosted double glazed window, ceramic tiled flooring, understairs cupboard housing electricity meter and fuse board. Side aspect frosted double glazed window, ceramic tiled flooring, close coupled wc with dual flush, corner wash hand basin, mixer tap, extractor. Front aspect double glazed window, wood block flooring, log burning stove, integral storage and shelving, radiator. Kitchen Area: Integral twin Bosch ovens, space for tall American fridge freezer, integrated Bosch five ring stainless steel hobb with extractor over, stone work surfaces with matching breakfast bar, inset sink with mixer tap and Quooker boiling water tap, integrated dishwasher, ceramic tiled flooring with underfloor heating. Dining Area/Family Area: With bifolding doors leading to the rear garden together with Velux roof lights, ceramic tiled floor with underfloor heating, ceiling spot lights. Ceramic tiled flooring, rear aspect double glazed door, eye and base double units, work surface with sink and mixer, spaces for tumble dryer and washing machine. Rear aspect double glazed French doors, ceramic tiled flooring, radiator. Radiator, laminate flooring, (door to garage). With access from the games room, the property has an up and over door together with power points. Side aspect double glazed window, door to shelved airing cupboard. Front aspect double glazed frosted window, three piece white sanitary suite comprising close coupled wc with dual flush, wash hand basin with mixer tap, bath with integrated shower over, ceiling spot lights, heated towel rail, ceramic tiled flooring. Front aspect double glazed window, radiator, storage cupboard. Rear aspect double glazed windows, Velux window to front, radiator, integral storage, ceiling spotlights. Front aspect Velux window, rear aspect frosted double glazed window, ceramic tiled flooring, walk-in shower enclosure, wash hand basin with mixer tap and storage below, close coupled wc with dual flush, door to boiler cupboard (housing Vaillant boiler), heated towel rail. Front garden comprises block paving for several vehicles with remainder given over to lawn. Westerly rear facing garden, approx. 40 metres in length, patio area with extensive area of lawn which includes a rockery with specimen cherry tree, several shrubs, bark chipped play area at the far end together with garden shed and childrens' wendy house and further specimen tree.